BBC NEWS | Americas | Washington diary: The next president? Washington diary: The next president? One could be excused for thinking that a 45-year-old African-American with barely two years' experience in the US Senate and a name that evokes America's two most hated enemies wouldn't have an ice cream's chance in hell of winning the presidency. But Barack Hussein Obama has proven once again that in American politics, truth is a lot stranger than fiction. I went to the see the senator's maiden voyage to New Hampshire over the weekend, my overnight bag packed with caveats and my pen dipped in Beltway cynicism. 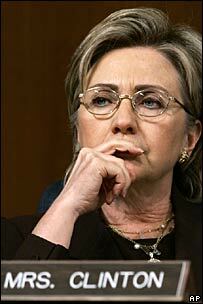 I came away thinking that Hillary Clinton has a huge problem on her hands. Since New Hampshire is one of the first high-profile pit stops on the rocky road to 1600 Pennsylvania Avenue, the voters of the Granite State regard politics with the same degree of zeal, snobbery and discernment as wine buffs at a Pinot Noir tasting or poodle owners at the Crufts dog show. They are quick to rumple their nose and curl their lip when dished up something that doesn't meet their expectations. So it was nothing short of astonishing that 1,600 of them had paid $25 each on a beautiful Sunday morning to see Barack Obama at the Radisson Hotel in Manchester. Isn't $25 how much you normally pay people to listen to a senator speak in public? As far as I could gather from the rapturous applause and the post-mortem interviews, the harsh cognoscenti of the Granite State left the event feeling it was money well spent. As John Distaso, the political editor of the New Hampshire Union Leader and the druid of primary politics, told me: "I have never seen anything like this... at such an early stage in the campaign." Early is an understatement. It's more than a year before the primaries and almost two years until the presidential election. As the governor of the state put it in his opening address: "We had booked the Rolling Stones until we realised that Barack Obama would sell more tickets!" The junior senator from Illinois, as the cable news networks like to refer to him, lopes on stage with an elasticity that almost verges on a dance. He deals with the hype graciously. "I am genuinely baffled," he told the adoring crowd, sounding genuine, "and so is my wife!" There are lots of deferential references to his wife Michelle, whom he met at Harvard Law School. It reminds me of the endearing way in which George used to talk about Laura. Barack Obama also has a good line to fend off any questions about his weird name. "When I first started to work in public life... people would ask: 'Hey brother, what's with your name? You called Alabama or Yo' Mama?'" As for the unfortunate middle name, Hussein means "little beautiful one" in Arabic and as the senator puts it: "The American people don't care about middle names." Assuming that the senator will become a candidate and stick around for a year or more, I am sure that his name will become campaign ad fodder. But as we discovered in the mid-term elections, too much mud-slinging backfires and America is not cruising for a bruising but yearning for a healer. And this is where the meat and potatoes of Senator Obama's speech comes in. 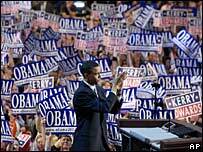 Ever since he wowed the 2004 Democratic Convention in Boston, he has been speaking about the need to overcome the bickering between Blue and Red, Democrat and Republican. He paints a picture of America that is more complex, nuanced and appealing than the caricature that most partisan politicians and journalists like to present. He knows all about complex. He is after all the son of a Kenyan economist who was "as black as pitch" and a woman from Kansas who is as "white as snow". He was brought up in Hawaii and Indonesia and he became the editor of the prestigious Harvard Law Review. He is religious without being born again. As he likes to point out the title of his best-selling book The Audacity of Hope - number two on Amazon - is plagiarised from a sermon given by his favourite Chicago preacher. He looks slim and healthy and yet he enjoys the occasional cigarette. In short he defies the pigeonhole. It also struck me that on Sunday his was virtually the only black face. I know that New Hampshire is a predominantly white state, but Mr Obama's campaign has moved on from the raw passion of the civil rights movement. He mentions Martin Luther King without reminding you of Jesse Jackson or Al Sharpton. Like Colin Powell, the senator from Illinois makes you forget he is any colour. He is also clever enough not to sound condescending or to tie himself into the kind of mental pretzels that strangled John Kerry. His inexperience in the Senate may turn out to be an asset and he has the same talent that JFK apparently had of appearing glamorous and humble at the same time. As for the hype: "It flatters me," he told the crowd, "but it also alarms me... because it says more about America than it does about me. "The fact that someone like me can attract a crowd like this shows that this country yearns for something new and different!" His voice is neither shrill nor pompous. Yes, Hillary has the machine, the money, the pollsters and the brand recognition - but she also has the baggage. She is the undeclared front-runner and according to history that is a dangerous position in the Democratic Party. After all, her own husband finished third in the New Hampshire primaries before going all the way to the Oval Office. The Senate has turned Hillary into a skilful deal-maker who rarely slips up. But is that enough to fire up the imagination of an electorate yearning for a compelling story? When pressed about an apparent admission in print that he had smoked marijuana, Barack Obama replied: "Yes, and I inhaled. That was the point." Watch out, Hillary! And, I might add, watch out John McCain, Mitt Romney, Rudy Giuliani! Hillary's supporters are constantly coming up with reasons she can overcome her limitations. 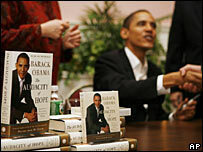 Barack's supporters wonder whether he has any. So, can he win? Can he raise the cash? Can he survive the rough and tumble of the campaign and the tough questions? Will the colour of his skin not count against him? Can he be convincing about security in the middle of an ongoing war? Can he survive the fickle adulation of the media? If the answer to all the above is yes, Barack Hussein Obama will be the 44th president of the United States... as strange as that may sound.